This gravy is simple but little different from paruppuurundai kulambu.. Making small balls from the dal and adding it to the gravy.. instead of other veggies, this gravy has lentil balls. Moong dal is soaked and ground to a fine paste, shaped into balls, steamed and boiled in gravy ,spices added to make this dish delicious;usually had with plain rice or with chappathi. 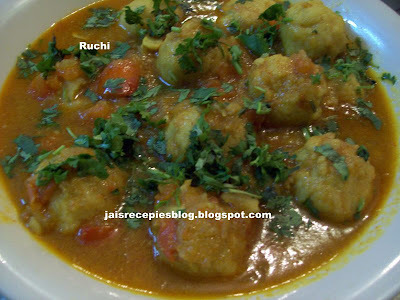 Moong dal balls Curry is a very tasty and healthy dish. Try it and enjoy !!! 1.Soak the dal in water for two hours. 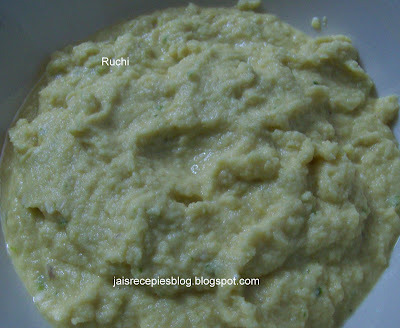 2.Grind the dal into a smooth batter with the ginger-garlic paste, salt to taste, red chilli powder, garam masala powder, and a dash of water. 3.Heat one tbsp of oil in a pan and add the dal batter and keep stirring for a few mins till it thickens slightly. 4.Now add ½ tomato, onion, chopped garlic and ginger. Stir again till it becomes a sticky mixture. 6.To prepare the masala, heat 1 tbsp of oil in a pan and add the onion, tomato, garlic and ginger. 7.Sprinkle the turmeric powder, red chilli powder and sauté for 2-3 mins. Then add the coriander leaves, green chilli and a dash of water. Mix well. 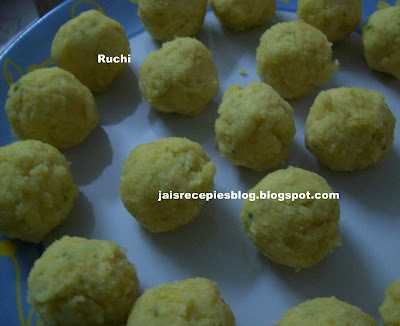 8.Once the gravy thickens, gently place the moong dal balls in the masala and cook for a 5-7 mins. 9.Mix well ,garnish with coriander and serve hot. Looks delicious.Check out my blog for a surprise. Hi Shree..i have something for u on my blog..pls check it out..
new to me. Looks more like malai kofta and sounds delicious. hi..h r u?..this looks unique dish.......a small treat for u on my blog..
What an interesting way to have moong daal....I'm going to try it! This is indeed different from Paruppu Urandai kuzhambu.. Will have to try this for sure.. :) Looks delicious..
Jaishree..well thats my name too..just happened to read your post on parupu urundai kozumbu..its a great recipe..my mom makes a slightly different version..will check with her and share it with you..you can try that too..
looks scruptious dear. u have a surprise in my blog. Hi thank you all for your encouraging comments and for awards. I feel happy.